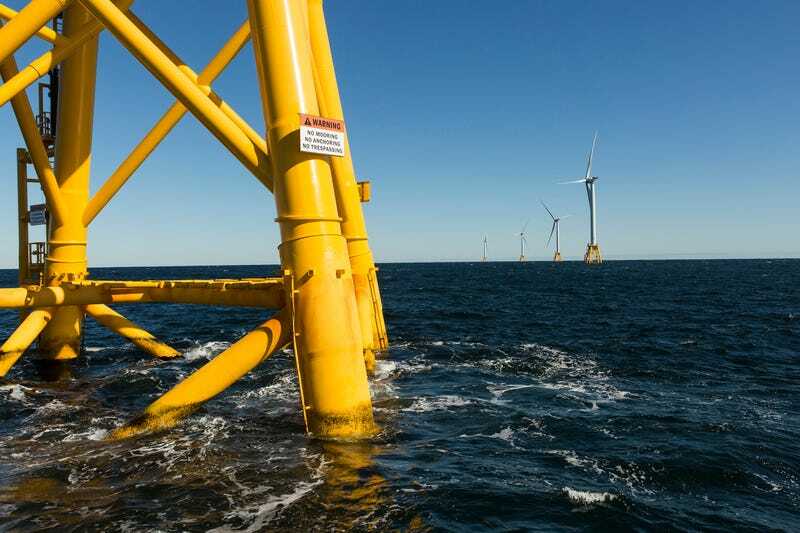 Anchored to the seafloor twenty miles south of Rhode Island, the five turbines comprising Deepwater Wind’s $300 million Block Island Wind Farm were erected over the summer. The blades were unlocked several weeks back, and in November, they’ll start generating electricity—30 megawatts (MW) at peak capacity, which is enough to power 17,000 homes. “The resource is enough to run all electrical needs for all coastal states from Massachusetts to North Carolina, and much more,” says Willett Kempton, a professor at the University of Delaware’s School of Marine Science and Policy. Now that Block Island is producing power, it’s been integrated into the system. In June, utility company National Grid—which is buying electricity from Deepwater Wind and selling it to customers throughout the state—installed a submarine cable connection linking the wind farm and the nearby community to the mainland. The clean energy Block Islanders will start buying this month isn’t exactly a bargain: the first year power-price is 24 cents per kilowatt hour, compared with an average of 14 cents per kilowatt hour throughout the state. But it’s about 40 percent less than the cost of diesel. The island will also be avoiding an estimated 40,000 tons of carbon emissions per year, and as an added bonus, that new submarine cable includes a fiber optic connection. For the first time, residents will have high-speed internet. As our boat weaves between turbines like a guppy amongst whales, I learn that there’s far more to the structures than meets the eye. Designed by GE, Block Island’s 6 MW, 589 foot-tall Haliade turbines employ new “direct drive” technology, which replaces the rotating gearbox of older models with a giant, permanent magnet generator. “This reduces mechanical systems inside the machine,” GE Renewable Energy project director Eric Crucerey says. “Fewer pieces mean less maintenance.” In fact, if all is running well, nobody will need to be inside the turbines at all. How big that surplus is depends on how fast the wind blows and how well the machines perform, something Deepwater Wind will be monitoring closely. On average, Kempton says, offshore wind operations run at 45 percent capacity. Land-based wind farms in the Great Plains run at about 33 percent capacity, while solar farms reach capacities of up to 20 percent. In a truly dire situation, Crucerey says, a person can sky-dive to the base of the turbine using rappelling gear attached to the helipad. Similar gear can also be used to exit the turbine from the tower, should the elevator break down. “People need training to be inside this machine,” Crucerey says. Indeed, these safety measures serve as a reminder that, while working on a wind turbine is much safer than working on an explosion-prone oil rig or inside a coal mine, clean energy plants are not risk-free. Human accidents involving wind turbines are underreported, but data compiled by the Caithness Windfarm Information Forum indicates that blade failures represent the biggest danger, followed by turbine fires. Will the industry catch on elsewhere in the northeast? According to Kempton, electricity from offshore wind is still about double the market cost, “which is kind of discouraging,” he admits. States that haven’t been eager to pick up some of that cost may be waiting for a signal from the feds—say, a tax credit similar to the soon-expiring production tax credit that’s driven the price of land-based wind power down. Of course, national energy policies depend entirely on who we elect into office this November and in the years to come. Correction: An earlier version of this story misspelled Dr. Willet Kempton’s name and mis-identified him as ‘Wilhelm’ further down in the piece. Eric Crucerey’s name was also misspelled on two occasions. We regret the errors.